Random And Some: "One of the interesting things about space is how dull it is"
"One of the interesting things about space is how dull it is"
It took some serious prodding by my buddy Tom, but I at last checked out and became enthralled with The Guide. 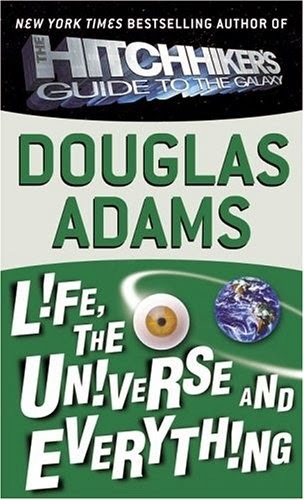 After The Hitchhiker's Guide to the Galaxy and The Restaurant at the End of the Universe, it was up to Life, the Universe and Everything, the third part of Douglas Adams' absurdist five-part trilogy, to take me on a wonderful and silly journey through the very nooks of the universe. At the start of the book, Arthur Dent and his old friend Ford Prefect reunite. The dynamic duo space-time travels to the Lord's Crickets Ground, two days before the previously-documented destruction of Earth by the Vogons. Shortly after their arrival, a troop of Krikkit war robots lands in the middle of the field, attacking the attendees and stealing The Ashes before departing. Shortly after the incident, Slartibartfast arrives and asks Arthur and Ford's help. And don't you worry: Zaphod, Trillian and Marvin return, too. I was a tad disappointed by LUE. The book was once again chock-full with Adams' clever turn of phrases, witty dialogues, and double-edged meanings, but overall, I found the whole a bit forced and too much all over the place. The story, which was originally pitched by Mister Douglas Adams as a six-part Doctor Who episode, is, paradoxically, perhaps the most coherent of all first three books, but I can't help but think that Life, the Universe and Everything Else didn't quite fulfill its potential.